Arctic Slope Telephone Association Cooperative (ASTAC) provides fixed and mobile broadband Internet access service (“BIAS”). 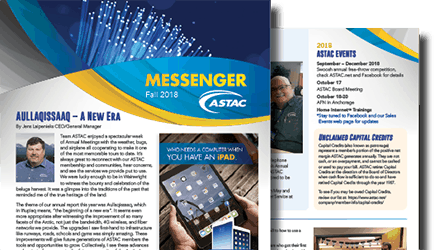 ASTAC is committed to providing BIAS in a manner that fosters an open and robust public Internet and that complies with the Open Internet Rules adopted by the Federal Communications Commissions (FCC). Subject to reasonable network management practices, in providing BIAS, the Company will not: (1) block lawful content, applications, or services; (2) block or restrict end users from connecting and using any lawful device of their choosing (provided such device does not harm the network, and conforms to widely accepted and publicly-available standards applicable to the service); or, (3) unreasonably discriminate in transmitting lawful network traffic. ASTAC does not engage in throttling, paid prioritization or affiliated prioritization. Like other Internet service providers, ASTAC manages its networks to protect the security, integrity, and reliability of the networks. To do so, ASTAC uses generally accepted industry standard tools and does not modify the protocols of these industry standard tools. We comply with applicable law, including laws for the protection of children online and the protection of intellectual property. Although our networks provide substantial capacity, they are not unlimited, and at times of high use our networks may experience congestion. ASTAC offers services with varying levels of bandwidth priority. Customers purchasing dedicated bandwidth have priority over end users purchasing services with best effort, protocol agnostic, and quality of service. This management method is designed to ensure that no one user is denied access to network resources. The Company provides Fixed BIAS over a combination of fiber-optic cable, copper facilities, and microwave transport. ASTAC utilizes a variety of transport methods to deliver internet service which will affect latency from 30-80 ms for terrestrial transport and up to 550-600ms over satellite transport. 1. Terrestrial Markets (Nuiqsut, Pt. Hope, Utqiaġvik and Wainwright): Home Internet10 and DSL (384Kbps/128Kbps, 512Kbps/256 and 1Mbps/384Kbps) are provisioned as a best effort service over ADSL over copper, or GPON over fiber as facilities allow, that is suitable for real time applications with bandwidths at the advertised bandwidths with a sub 100 ms latency. This service is not impacted by specialized services. 2. Satellite Markets (Anaktuvuk Pass, Atqasuk, Kaktovik and Point Lay): DSL (384Kbps/128Kbps, 512Kbps/256 and 1Mbps/384Kbps) is provisioned as a best effort service over ADSL over copper that, due to the latency on the satellite, is not suitable for real time applications. Bandwidths are at the advertised bandwidths (subject to the AUP) with a 650 ms to 800 ms latency. This service is not impacted by specialized services. The Company provides mobile BIAS over its state-of-the-art wireless radio network in its licensed service area using 4G (UMTS) and 4G LTE (LTE) technology. 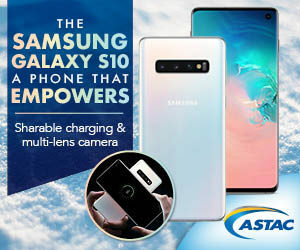 The expected and actual speeds and latency for ASTAC’s mobile wireless BIAS will depend on the customer’s proximity to the cell site and whether the customer is receiving service on a 4G or 4G LTE network. The TSR for 4G is 22 to 168 with latency between 60ms (terrestrially served community average) and 600ms (satellite served community average). The TSR for 4GLTE is 86 to 324 with latency between 60ms (terrestrially served community average) and 600ms (satellite served community average). Customers can expect speeds and latency as stated above for the particular service (terrestrial, satellite or mobile) and bandwidth or data plan to which they subscribe. Internal testing by ASTAC has confirmed actual speeds and latency are consistent with the speeds and latency stated herein and advertised on our website. Information about pricing of service is available at www.astac.net and terms and conditions of service are located here. If you have questions or concerns about our open Internet policies or how we manage our network, please contact us at info@astac.net.